Broad money is the definition of the Money Supply which includes a wide scope for the definition of money – including both notes and coins, but also more illiquid forms of money – such as bank deposits, treasury bills, gilts. These are considered ‘near money’ because it can easily be changed to cash. Narrow money is seen as the basic amount of notes and coins and operational deposits at Bank of England. Broad money includes notes and coins but also saving accounts and deposits in a savings account. Broad money can also include Treasury Bills and gilts. These financial securities are seen as ‘near money’ because they are more illiquid than cash and instant saving accounts. Broad money does not include assets, such as long-term dated securities and shares. Although these can be sold, they are not included in terms of broad money because they fall in the category of assets rather than money. 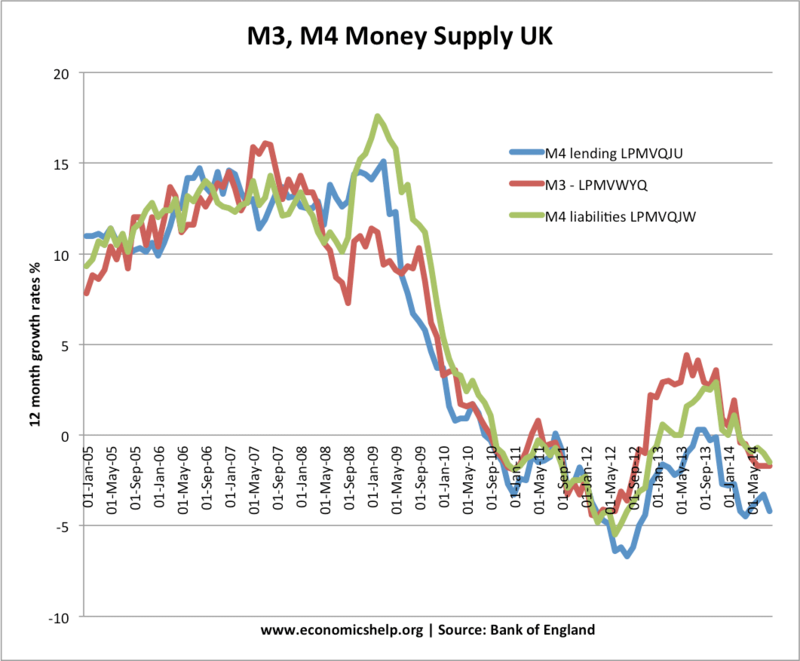 M3, M4 lending and M4 liabilities. M4 Growth has been weak.